Finishing a unit that involves live organisms? Looking for living organisms for an upcoming science unit? Science Fun For Everyone is here to help! Living organisms can be a phenomenal tool to “bring science to life”! Upon completion of a science unit, nobody wants to see the organisms destroyed. Science Fun For Everyone will adopt and care for these creatures then deliver them to another school who is in need. Please see below for information on either requesting live organisms or having SFFE adopt yours once they’ve served their educational purpose. *Due to limited resources, this service is only available for Wake County Public Schools at this time. CLICK HERE for information on donating your live organisms to SFFE. CLICK HERE for information on adopting live organisms for your upcoming science unit. 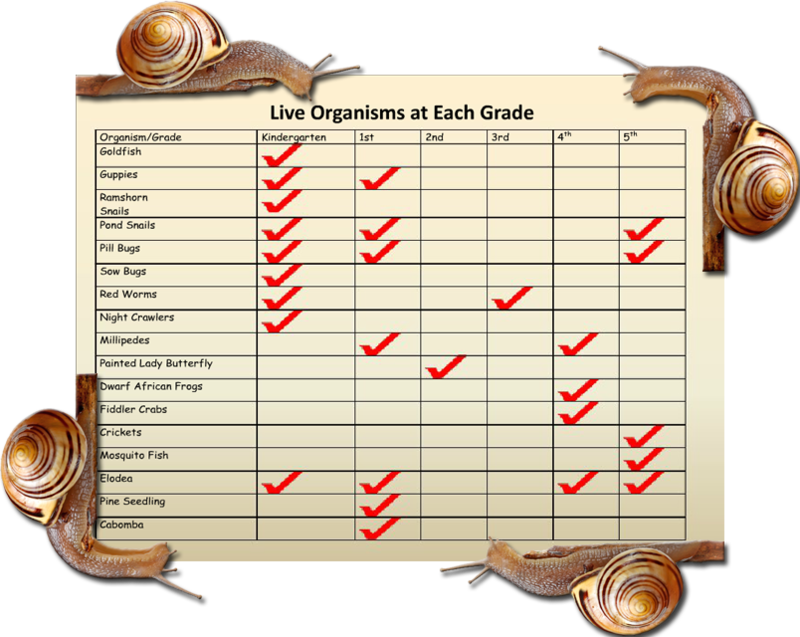 This chart shows how some organisms can be shared with other grade levels.